In his ’99 travel tome The Distance to the Moon, James Morgan writes, “The Nebraska plains pack a cumulative power… and I knew that if the sun were out today the heat would already be unbearable. Nebraska in summer is like living in perpetual noon… The trains, Union Pacific, kept rumbling by -I counted six of them in less than an hour- and each little town I passed through (Lexington, Cozad, Gothenburg) had its own tin-roofed elevator by the tracks.” I liked his descriptive choice of words, especially the ‘cumulative power’ part. They bring to mind the brunt opposing defenders took after successive series’ against the cumulative power of those 60 & 3 offensive lines. One of the diesels steadfastly churning up the turf yard by green yard was guard Chris Dishman, the Cozad Collosus. Joining his teammates on many a sticky, sultry, summer afternoon workout in the perpetual noon of a Lincoln steambath, he laid down track and rolled into history as a punishing piston on one of the most dominant rushing lines in college history, the ’95 edition of the Pipeline, and spent some years doing the same in the NFL ranks. Let’s catch up with ‘Dish’…. Question: Hey, Dish, when was your freshman year at Nebraska? Chris Dishman: My first year was ’92. Q: Did you know many guys when you first arrived on campus? CD: Yeah, I knew Brendan Holbein, who was my teammate in high school. Ryan Terwilliger was from Grant, Nebraska out west, and Jeff Ogard. And I’d played with Damon Benning and Clinton Childs and those guys in the Shrine Bowl, but other than that it was just showing up to camp. Q: You and Brendan were in the same high school class? CD: Yeah, we were team captains. We were the State High School Champions in Class B.
Q: So you aleady knew a little success, eh? CD: Yeah, we played pretty well. I think he was the all-time leading rusher in the state of Nebraska for a few years. He averaged almost 3,000 yards his senior year. Q: Running behind you, I take it? CD: We actually had a pretty decent line in Cozad. We had a couple guys: one went to Wyoming, another to a smaller school in Nebraska. So three of us went on to play college football. Q: So it’s your first day of fall camp. What stood out to you most? CD: You know, it was run like a business. You basically showed up and you knew what to expect and they mapped it out. Pretty cut and dried as to what was going to happen. It wasn’t like high school where you just kind of show up and you kind of figure it out over time. Everything was written down and done to a schedule. I remember it was a smooth transition when you looked at the schedule and you knew what was going to happen next. Q: Were you on the last freshman team? With Lundberg and Wiegert and Zatehcka? They never wanted breaks, so I just had to basically sit on my helmet. And when they said they needed a blow for water I just jumped in there for one play before they came back. Q: Was it a pretty easy transition for you stepping up to the next level, then? CD: I don’t know if it was an easy transition. But with football, the x’s and o’s always seemed pretty easy to me. And that helped me out when I went to the pros, too. It wasn’t that I was so much more physically gifted than anybody: it was that I mentally understood the game, the concepts behind the plays, the philosophy of what they wanted to get done. I think that’s what helped me out, I guess. And it was kind of a complex system with all the shifts and motions that Osborne did. It was complex to a point, I guess. Once you got it it was so simple, you know? But learning it at first? People don’t understand all the complex shifts and motions and what Coach Osborne was trying to get accomplished when he was doing that. Q: Have you had a chance to read Coach Tenopir’s book? CD: No, I haven’t read that. Q: I told him a few weeks ago that I was going to do a little homework by reading his book in advance of our interview, and the cheapest I could find one online was $90. Which tells me that the coaches who own it consider it pure gold since they’re not reselling it very cheaply, you know what I mean? CD: Right! It was very efficient. From the blocking schemes to the fullback to the I-back to what everybody did, everyone in the whole system had a part and they had it broken down in detail to what each one individual had to get done to make the play work. It just showed what kind of assistant coaches Coach Osborne had, too. They were all part of that whole process; we’d work on our individual position drills first and then we’d put our product together on the fields when we’d come together, and it would all work so well. Even though we’d be working on the same plays apart from each other up to that point -working on different aspects of the same play- things seemed to work out. It was pretty cool when it all came together. Q: So Chris, you went to Arizona to play pro ball, right? CD: Yes. 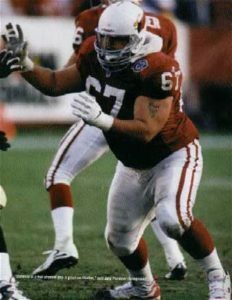 I played seven years in Arizona and one year with the Rams. Q: What about Coach Young and Coach Tenopir? What would you say about their teaching and coaching methods? CD: I just remember the times that we spent with them: Coach Tenopir was more of a fiery guy and Coach Young was more of a laid back kind of coach. Coach Tenopir would get so riled up right before game time… he’d get so pumped up right before the Saturday speech right before the game, and we’d be ready to run through a wall for him. He wouldn’t share a whole lot of emotion, he was more of a stern kind of guy. But you knew when he wanted to get something accomplished: his voice would start cracking and he’d have that chew sticking out of his lip. 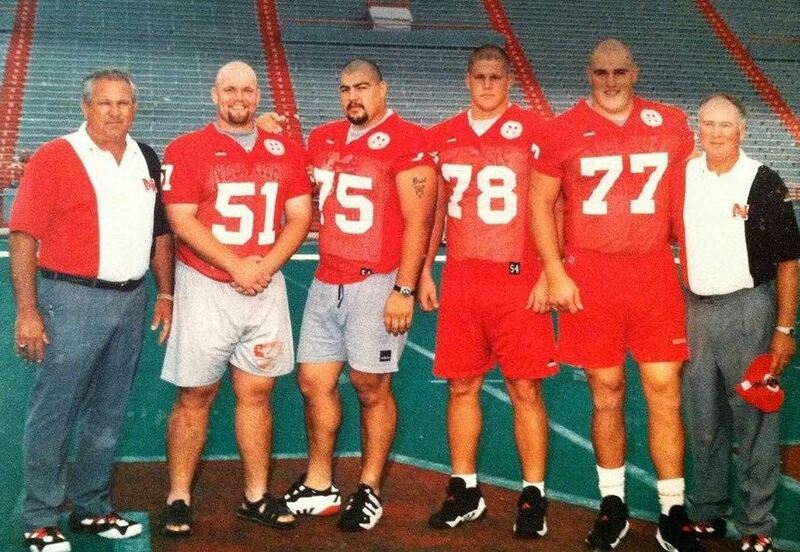 (laughs) What I remember most about Coach Tenopir was the Saturday morning meetings over in the Nebraska Center and all the O-line was in their own room, and he’d get up to give us a motivational speech. He always got us fired up to go play and kick some heads in. Q: Do you recall how the typical speech would go? CD: You know, that’s the bad part. I try to think back and just remember the feeling. I don’t remember the words he used or anything like that, I just remember the feeling in the room and the dead silence among us and all of that. I probably got hit in the head too many times. (laughing) I talk to some of the guys and they remember everything, and here I don’t even remember the plays sometimes. Q: A lot of guys compare and contrast Milt and Charlie McBride. Would you say that Milt was like the offensive ‘Charlie,’ so to speak? He’d get a little more fired up than most? CD: Oh yeah. Those two were the ringleaders when we went down to the pit. Down there in the pit where we did the one-on-one blocks and stuff like that? Those guys were the instigators. They knew there were gonna be fights that broke out there and they knew Coach Osborne wasn’t going to be down there. It was pretty much ‘anything goes’ down there. Q: I’m thinking they were putting their bets on Christian Peter? Q: In your early years, who would you usually go against in practice? CD: My early years, I remember the first time I did one-on-ones in practice it was against Trev Alberts. Right away, right out of the gate, my first one-on-one. I had a run block on him and actually came off and actually stood him up and got him right there at the line of scrimmage. I got the best of him. And then Charlie just ripped into him and they told me to get back on the O-line, and “We’re gonna do it over again.” And the first thing that hit the ground was the back of my helmet. He just ran right through me the next time. That was my introduction to one-on-ones. I got him the first time, but the second time wasn’t so good. Q: There wasn’t much time to gloat over your victories down there in the pit, eh? Q: Now, was Coach Samuel down there because Trev was? Q: What about Coach Dan Young, where did he fit in the mix? CD: He was kind of our Passing Coordinator for Nebraska and when we were in our prime I think we threw 20 times the whole year, so the passing game wasn’t a big focus. But I remember vividly the meetings when Coach Young would say stuff in there. His passing technique went like, “This isn’t AT&T. You don’t have to reach out and touch somebody.” (laughs) He’d make comments like that, and then if we had to pick up a linebacker he’d say stuff like, “It’s like the free spot in Bingo. If you want to take him, take him. If you don’t want to take him, don’t take him.” (laughs) That was like his passing techniques to us. It was kind of funny. Things like that stick out in my head. 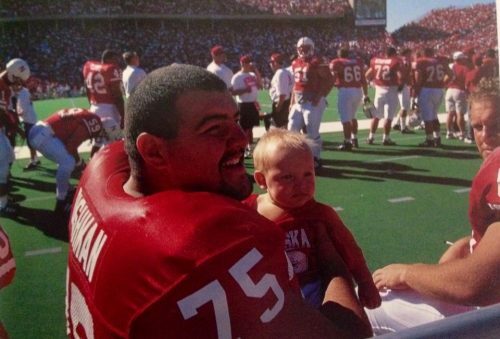 Coming from Nebraska and going on to the NFL, the passing technique that we learned at Nebraska was totally different than what you learned in the NFL. (laughs) But we didn’t have to pass block because if you’re getting 6 yards a play on the ground with a carry, why would you think about throwing it? Q: And even if we did it was usually play action, so it wasn’t like the pocket was getting pressured on a 7-step drop? Q: What about your interactions with Coach Osborne? 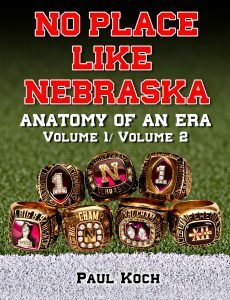 CD: You know Coach Osborne still -as old as I get?- is still the same guy. He still has the same respect factor, the dad factor. It’s kind of weird, you know, how you don’t want to get out of line. I’m 35-36 years old now, and he’s still so high on a pedestal. Whenever I see him I still get nervous to talk to him. It’s like, ‘Hey Coach.’ Like he’s gonna scold me for something, you know? (laughs) It’s kind of weird that way. You have so much respect for him that you don’t want to say the wrong thing or do the wrong thing. It was that way when I played, too. I always respected all the coaches with the most respect I could. Even Tenopir’s the same with me. 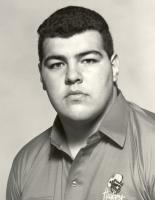 Coach Osborne a lot more so -because I was with Coach Tenopir every single day- but Coach Osborne was the head guy. He gets all the respect he deserved and he put up with a lot of stuff when we were playing, you know? And now he’s still like a father figure to a lot of us. Q: So ’96, was that your last year? CD: Yep, ’96 was my last year. Q: Tell me about your arrival. Any of the starters and/or leaders have an impact on you? CD: When I was a freshman, Coach Tenopir always said to watch the older guys in front of you and they’ll show you the way. I had Will Shields there, Jim Scott, Kenny Mehlin, Lance Lundberg and Zach Wiegert. That first 5 were starting then; they were pretty good leaders, especially watching Will. Will was never the vocal leader but more the silent guy, does everything right and actually does it to a perfection that none of us could really achieve. He was so good at what he did, and that’s probably why he played 13 years in the Pro Bowl. That’s something that stuck with me through the NFL and everything I’ve done, ‘I don’t want to come out of the game. I want to make sure I’m in there.’ And if I’d push my body to a point where you’re just dead, that’s when you felt you’ve actually accomplished something. Trying to pace yourself was not an option. You always pushed yourself to the limit that you think your body couldn’t take it anymore, and then you pushed it a little bit further. That’s what I learned from those guys.